A little jump back to that time we were in Milan for fashion week. I told you guys, we still have so much to share with you. So many beautiful images that still need to be published! It makes me so excited to simply think about it. The past couple of months have been so rich with travelling, I actually feel like a real, proper nomad. In fact, it is quite lovely to settle down in L.A for a full month in a half, although tomorrow already, we’ll be doing a roundtrip to New York for a new project. What can I say, no time to wait, no time to rest, let’s get it going! Los Angeles, is definitely my happy place. There’s so much happiness and creativity in the air. I can feel it everywhere and grasp it so easily. Not to mention that I’ve been spending my days in organic super markets and restaurants binging on tons of super foods and yummy goods to recharge my batteries after fashion month and make the dose of vitamins. Gotta keep it healthy! There’s nothing better than a little detox after an intensive period like this one (I’m still over-indulging with ice cream, chocolate and macarons of course, come-on). I promise, I’ll reveal more of what we’ve been up to these past couple of days, but all I can say is that we’ve been making good use of the house we rented. It truly, really feels like I always lived in L.A. It’s so nice to do our own grocery shopping instead of going out every night. Loved buying little details for the house like candles, flowers to make it super cozy and a nice environment for productivity. So here’s a little bit about what’s happening in our sunny L.A you guys! Now back to this outfit I decided to wear to the Pucci show during MFW a couple of weeks ago (oh my dear, it actually feels like ages ago now!!!). I wanted to create a super sleek and chic outfit by mixing this black leather skirt with some more colorful and unique details such as this absolutely amazing Pucci jacket, which is honestly an art piece. The Shourouk headband I just got from Monnier Frères was also a perfect fit but the details that really punctuated the whole look were of course these beautiful, iconic Chopard happy diamonds. Because a girl can never say “no” to a little diamond, especially during fashion month hehe. That blazer is pure perfection! I <3 it so so much! You are awesome! Amazing outfit! Could you please show us your house in LA as i´m really interested in your taste when it comes to interior design ;) Would be soo cool! Much Love for you and your work!!! The jewelry you're wearing is precious! Love it! What a wonderful an intricate blazer! Great skirt and goes well with that top. Fabulous heels, clutch and wonderful headband! In one word: AMAZING! I am so in love with this look! You look amazing, Kristina! Love the embellished jacket and the headband! So cute! I love the embellished jacket and that pleated skirt! Very nicely done with the accessorising! I am totally in love with this look! You look amazing, Kristina! The perfect Italian outfit!! Love your hair like this, I wish I could always do them this way!!! You look marvelous. Love the cute headband! Your blazer is amazing, love the pictures! Hello! I really like your lifestyle so could you do an article about non-gluten food, cooking, healthy snacks and so on please ? Could you also do a "house tour" of your new home in LA maybe ? Thank you a lot and i wish you all the best! I especially love the diamond jewellery with this headband. You have the best style! So so so beautiful! I love the headpiece, it's so elegant! Really beautiful jaket! And the headband is really stunning, nice color ! Are you in l.a To make your musical disk ? Love the outfit you are wearing! The blazer looks great paired with the simple dress. such a perfect outfit! love the jacket! Kristina, this look is gorgeous and the photos super beautiful! But I think they are little too big because they are loading too long. beauty !! Love your outfit !! The necklace is vert nice !! that necklace is very nice and delicated !! Beautiful post, love the jacket and the hairstyle! Also, I wrote a post about you and I have noticed that your body changed so much lately. Maybe you should write a post about your health and fitness routine. Oh wow, these photos are breath taking and stunnig! I love it! And perfect styling as well! The blazer must have taken hours of handwork! Nice combination! The detail in the blazer is incredible. It is a something you could stare at forever! You look breathtaking!! You're my style icon, so inspiring! beautiful jacket! And I love the headband! Beautiful outfit! The jacket and the headband matches perfectly! Love the skirt and the jewelry are gorgeous! The jacket is truly a piece of art! You could probably wear it with anything, and still look amazing. Gorgeous styling, absolutely perfect on you! Love your blazer and accessoires. The headband is utterly amazing! You look gorgeous! REally spectacular! Seriously, he headband is great! you look absolutely beautiful and royal! Wow not only the outfit is true perfection but so are you! You look absolutely stunning in these photos especially the headband adds something royal to the look (maybe its just my opinion but oh well). LOVE the look. Feeling the Baroque atmosphere somehow. :3 Looking stunning, as always!! You're absolutely right, that jacket is stunning! And every single other piece of clothing and accessory is beautiful as well! what a perfect outfit for milan! ohhh what a lovely headband! I want it!!!!! LOVE this beautifully beaded jacket. 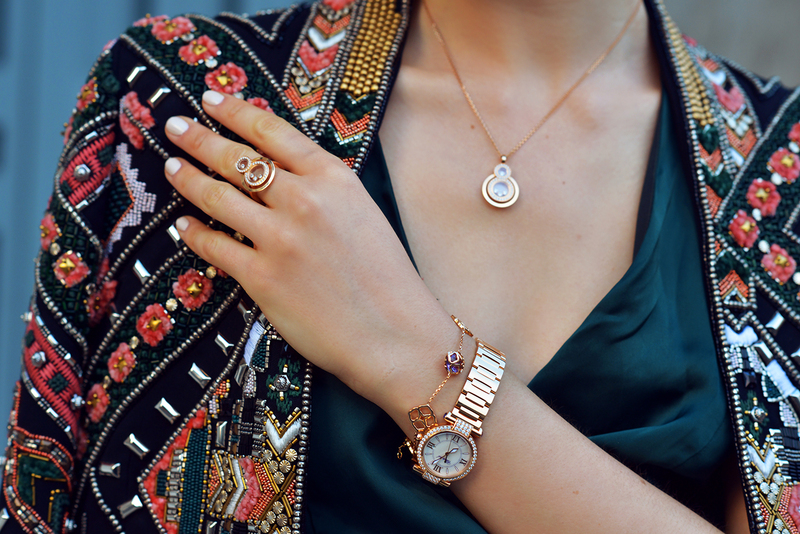 And this collection by Chopard is gorgeous! bonsoir kristina ;quelle finesse! quelle beauté ! quelles tentations!!!!bravo!!!!! The jacket and the headband are so beautiful!! These jewelry pieces are gorgeous! beautiful!! I love that jacket!! Wonderful outfit ! you re so stunning ! Your blazer is so beautiful, it matches perfectly with your headband Shourouk! This jacket is to die for! The embellishment is lovely, and your styling is awesome, especially with the leather skirt and lace cami! And your outfit looks quite nice! & I love it that the leather skirt looks flowy! Wonderful, beautiful, adorable, nice, charming and amzing! ABSOLUTELY LOVING THIS LOOK! This blazer is just beyond amazing! These photos are breathtaking! And the whole combination of clothes and the place... everything is always so perfect. Kristina, thank you for the inspirations! That first photo is out of this world, so gorgeous! And all this teal & blue inspiration..
Really love this sophisticated bejeweled look with the diamond jewelry, headband and exquisite beaded jacket! Elegant and chic! BEAUTIFUL blazer. My goodness, I wish I had your wardrobe. Your pictures are seriously out of this world! Stunning blazer. You look like a modern day byzantine queen! Do you really have flawless skin or epic photoshop skils?? haha - amazing!! Gorgeous outfit, I especially love the headband. www.saradujour.me | a Toronto-based lifestyle blog filled with food, friendships, fashion, fiction, and femininity. hum.. your ''lifestyle'' that you were promoting so nicely a few months ago is now reduced to a Coco Chanel purse? Where is your artistic sense of style and originality? You are falling under the materialistic side of things my dear, please do not starting snobbing us because we cannot all afford brand new designer handbags. I resent all those bloggers who use their blog as a platform to promote self-indulgence and rich lifestyle. This is not who you reall are. you can now afford Chanel, Vuitton and so much more. We GET IT. This is not why we read your blog. Salut Kristina, as-tu deja entendu l'expression ''nouveau-riche''? C'est ce que tu es devenue par la force des choses. Les nouveaux-riches veulent montrer qu'ils ont du fric de façon ostentatoire, et veulent afficher leurs richesses et leurs biens matériels. Ce n'est pas vraiment ce que j'appelle un style unique. Tu es comme les autres maintenant. Tu vas croire que ah ils sont juste jaloux, mais ce n'est pas de la jalousie, c'est un problème de société et tu le confirmes. Je pensais que tu étais plus originale et intègre face à toi-même. Mais tu n'es qu'une petite fille qui cherche la reconnaissance et sacrifie sa personalité pour devenir une chanteuse qui porte des fringues. Bel exemple à donner aux jeunes filles.... Je ne suis plus ton blogue maintenant je vais rechercher de l'originalité. Wauw! Sooo love your look! especially the mix with fabrics!! Love this baby face and your ouftit is perfect ! That blazer is so beautiful. It's such a fantastic statement piece. I love these materials together, I can almost feel how soft they are. Stunning Kristina! I love everything on this gorgeous outfit. First of all I love these skirt where I look on it at the online shop many times. I love how you style it with the blazer, shoes, top and that fantastic heanband. That is really the key piece of this look and I love it so much. Amazing. I wish you a great day in New York. What happened to your singing video? Are you still pursuing that? This look proves that it really is all in the details- love the earring in just one ear and the peek of lace above the top, and the jewelry of course! Your posts are always so inspiring! Thank you for that! Just love the complete look. It's really gorgeous. The jewelry looks adorable! Love this look! easy to style up or down, and for every occasion! Love the headband too!! I really love the headband, its so gorgeous! OMG the skirt and the blazer! stunning outfit K.! Girl you are so perfect that only your feet remind us that you are real! :D Love it! Where shall I start? First of all I want to tell you how proud I am of you and the Kayteam. You all make this blog not only my fashion inspiration (btw you are my absolute fashion icon, and I absolutely share all your thoughts about classic and timeless clothing, I have been a super classic girl since I was about 10 years old, wearing Lacoste shirts! Haha) but you also make it my weekly (or daily) disconnection from the chores and stress of the week. Lots of love and good luck on your new projectss!!!!! I am already looking forward to seeing them on the blog. Beautiful outfit, the blazer's gorgeous and thehaor band's really lovely! I haven't been visiting Kayture in a too long time so at least for me this styling of your blog is new, and it's great! The whole outfit is perfection. A favorite of all your Outfits ever! Thx for being such a gorgeous inspiration! The jacket makes me think of a story.It s like is more to tell. Your jacket is gorgeous! I love the beautiful and intricate designs and details. It looks absolutely beautiful and definitely does tell a story! always love all of ur cute jewelries, such a beauty! j'aime bien l'ensemble collier/bague/bracelet, surtout la bague en fait, j'aime beaucoup. Love the jacket, perfect with your top and your skirt, makes the look gorgeous! I find it very cute collection colors and very fashionable combination Love your jacket! Wow, sublimissime! Ça faisait un long moment que je n'étais plus passée par ici, j'adore revoir toutes tes photos !